OpenOffice Writer is a word processing program that includes the ability to place tables into a document to help organize data and make information more easily accessible to a reader. Rather than try to create a table and add text into it, you can make Writer do the work for you by automatically converting text to a table. Why Convert Text to Table in OpenOffice Writer? Although many word processors such as Microsoft Word and OpenOffice Writer allow the user to create and edit tables in a document, it is no secret that doing so can be frustrating and inconvenient. It is often difficult to position and edit the table in a word processor to get it to look exactly as you want. 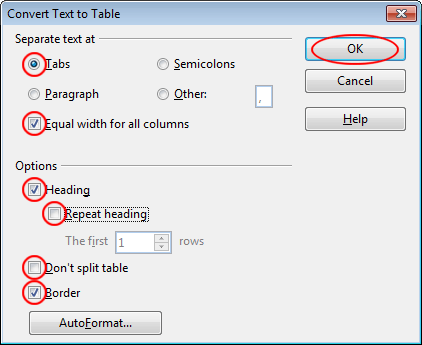 OpenOffice Writer includes a helpful function that lets you automatically convert text directly into a table without having to create and edit the table manually. Using tabs, semicolons, paragraphs, or commas to create columns and new lines to create rows, Writer will automatically place your information in a table and offer you the choice to add headings and force each column to have equal widths. Suppose you have some text in a document like that pictured below. Notice that the information has a heading to show what each column contains and that the information is separated by tabs. To automatically convert this text to a table, begin by selecting all of the text. This is an important step because it tells Writer exactly what text to convert. With the text selected, click on Table>Convert>Text to Table from the menu. You should now be looking at the Convert Text to Table options window. In the section labeled Separate Text At, select the Tabs option. Check the option titled Equal Width for all Columns. This forces all columns to be the same width and creates a neater appearance than when columns are allowed to be different widths. Select the Heading option and uncheck the option titled Repeat. We only want the heading in the table to appear once. Note that Writer automatically assumes that the first row contains the header information as it does in our example. Make sure the option titled Don’t Split the Table is unchecked and that the one labeled Border is checked. Finally, click the OK button. If you chose the options as described above, you should now have a table in Writer that spans the width of the page, has equal width columns, has a header in the first row, and has the remaining information in the cells below the header row. When looking at the Convert Text to Table options window, you may have noticed some options that would have been better for the table you are trying to create. For example, unchecking the Equal Width for all Columns allows the columns to use up only as much space is needed to display the information in the cells. In the Separate Text At section, you’ll notice that you can use other parameters to separate the cells such as Paragraphs, Semicolons, or Other. In the Other category, you can choose any separator; commas are a common separator (sometimes called a delimiter). 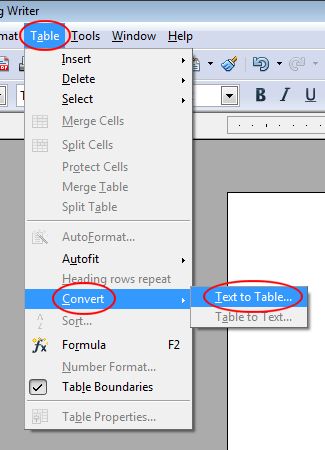 Using the Convert Text to Table feature in OpenOffice Writer, you can automatically create tables without having to manually insert them into the document. This not only saves time but saves you the trouble of having to edit the table to make it look uniform and professional. I've used this many times when importing data into writer. Good tutorial.